Don’t Drop It On Jordan! Jordan. The Hashemite Kingdom of Jordan. The Other Holy Land. No matter how you say it, Jordan evokes images of the ancient and beautiful. Modern cities and ancient ruins coexist in harmony, attracting visitors from all over the world. Look around the Arab World. Can you find a more beautiful landscape? Can you find friendlier, more hospitable people? I don’t think so. Yet, there is a blight on this country. It is noticed and commented on by visitors. That blight is litter. I’ve commented on it and questioned people about it over the past ten years. The answers are frustrating. The most frustrating, to me, is the one that says “I’m doing this because it keeps people in a job”! Really? It keeps people in a job? There isn’t enough sand and soil in the gutters to keep the street sweepers busy? It’s quite possibly one of the lamest answers I’ve heard yet. “Look around you! Everyone else does it, why should I be different?” It’s true. Litter seems to act as a magnet. If you see one of the ever-present plastic bags on the ground, you see no reason not to provide it with a bit of company. Another bag, perhaps, or a water bottle or empty cigarette packet. Travel any street or road and you will see thousands of the plastic bags from the shops and supermarkets. They are so pervasive, I’ve recently begun to call them the “national bird of Jordan” because they are to be seen on fences, in trees and gently floating through the air. Just a day or two ago one was caught on my outside rearview mirror as we traveled on the Desert Highway. I’ve visited a great many homes and ridden in a lot of cars here in Jordan. I can tell you this from my own experience; all of them were immaculately clean and neat! So, why do we keep our homes and cars so impeccably clean and trash the environment in which they stand, and travel? On more than one occasion I have observed people of all ages and both genders approach the rubbish bin in our street with a bag or two of trash. I say approach, because they don’t generally get nearer than 2 or 3 meters before tossing their bags. Fully 98% of them fall short of the goal and land on the ground. Most times the thin, fragile plastic breaks and the wind takes the trash on a whirlwind tour of the neighborhood. Why? Every person I’ve met in this wonderful country has proudly welcomed me to Jordan. Their speech and actions demonstrate an astonishing amount of pride in their nation, their history, and their heritage. Yet, a quick glance around shows something else entirely; an indifference to the trash that litters the streets, parks and country-side. As a foreigner here, I may be overstepping my bounds by posting this rant, but I’ve come to love the Hashemite Kingdom of Jordan and her people. I think of it as my home, too. I really wish you wouldn’t drop trash in our home! 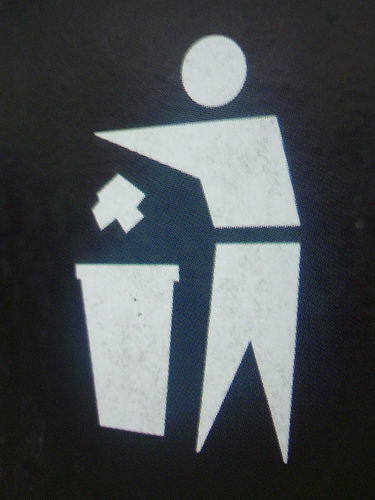 This entry was posted in Random Musings and tagged Jordan, Litter, my opinion, rant, rubbish. Bookmark the permalink. 14 Responses to Don’t Drop It On Jordan! I remember Jordan’s national pride, and beautiful country when I was there two years ago. I don’t remember the trash…so sad! Thanks for stopping by Jarm! I’m so glad that you don’t remember the trash, and I hope you’ll come visit us again soon. Thanks for coming by and commenting Amy! Mother Nature gave us a beautiful place to live. It’s a shame that so many show disrespect for that gift by trashing it! thanks for your lovely post, i agree with most of what u said, but i also think that one way of combating habit is by the enforcement of law. because those who throw litter from the windows of their car, or in the streets had no real law to rule their lives and their habits. Jordanians in UAE don’t dare to throw a bit of litter in the streets. do you think it’s because they love UAE more ? not really!. and yes, raising our children to stop this habit not only by telling them so, but as well by showing them, and being the change we wish to see in people. Thanks for coming by and commenting Lama! My experience back in the states is that firm enforcement and stiff fines are the only way to combat littering successfully. It worked there, it can work here! Writing about “ugliness” of a country that we love isn’t easy at all. i know that, since my country also has tons of weak points that i want to say out loud. But we have to mention them, if we want those bad ones get better, right? If we do nothing and keep saying “that’s because i love this place”, it turns out to be a blind love. Thanks for stopping and commenting .c.g.! I really like your analogy of the footballer! It’s so perfect! Thank you for this Jim. I have written 3 children’s books dealing with the litter problem in Jordan, one which was published a year ago, Anzeh al Azeeza Cleans Up Petra, one which is just about to be published and one that still has a way to go. I am passionate about this topic so if you would like to exchange some ideas I would be glad to do so. Your rant is definitely valid. You are right we Jordanians are very clean when it comes to our homes. Jordanian women show pride in how clean their casa’s are. Unfortunately, it is very bad thing we do regarding outside our houses. And it seems no one yet is able to decode the reason behind this ugly habit. Although, it is very easy habit to get rid of we are doing nothing and it seems we don’t care to end it. Shame! As Lama mentioned Jordanians overseas behave differently. So, maybe there is a reason beside that we need to teach our children and show them how to do it. Is forcing laws has anything to do with this? I think so, maybe. Thanks for stopping and commenting, Jaraad! I think we can change the way people think about dropping trash on the ground, but it will take time and the backing of the government. I have personally seen that it can be done. I wonder if we have enough people in Jordan who are willing to do it? Jeremy Irons presented his documentary on “Trash” in Cannes. Where trash is thrown all over the world, is simply horrific. We should only buy and eat what we need on a daily basis. Great site, well done! Thank you for your kind words. I routinely buy only what I need for one or two days. The inescapable plastic bags are stored in a trash bin for recycling.